EULESS, Texas (Oct. 27, 2017) – Superior Concrete Tiny Houses and its affiliate company Superior Concrete Products debut another new innovative home – The Texas Two-Step during the 2017 National Tiny House & Simple Living Jamboree in Arlington, Texas. The Jamboree begins at 3 p.m. today, Friday, Oct. 27 and lasts until 5 p.m. on Sunday, Oct. 29, and will prominently feature the Texas Two-Step, a relocatable park model tiny house which has exterior walls made entirely out of precast concrete. 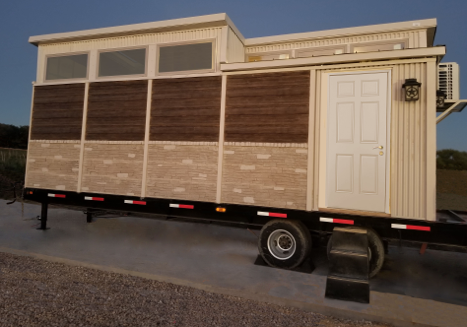 Superior Concrete Tiny Houses and Superior Concrete Products are owned and operated by CEO Todd Sternfeld, a construction company owner, entrepreneur, land developer, tiny house dealer and custom builder based in Texas. Todd Sternfeld, CEO of Superior Concrete Tiny Houses — The Original Concrete Tiny House Co. Debuts “The Texas Two-Step at the 2017 National Tiny House and Simple Living Jamboree. Precast concrete made by Superior Concrete is attractive and realistic in appearance. To build the Texas Two-Step, the company’s construction team used a blend of warm wood-toned concrete timber siding which gives a modern twist on a rustic Hill Country theme making the exterior of the Texas Two-Step inviting, durable and completely maintenance free. Laminate products and engineered stone were also used in the home’s interior to ensure that this tiny house is as care-free as possible. A park model tiny home, The Texas Two-Step includes all the luxurious amenities and modern conveniences found in a full-size home. The Texas-Two Step is secured on a custom steel frame trailer so it can be relocated to a home site, lake lot, tiny home village or community or other suitable location. With 225-square- feet of well-designed living space, this home is built to be comfortable and functional while requiring little to no maintenance inside and out. Featuring a front and a back door on opposite sides of the unit, this tiny home has ample room for two or more occupants, and a large loft has been added for sleeping and extra storage. For added living space, The Two-Step also has a large front porch which provides room for entertaining outdoors. Engineered stone made by Neolith is used for the kitchen countertop, and on the floor, walls and ceiling of the bathroom. A waterproof, sound reduction flooring is used in the great room, hall and bedroom areas to ensure that spills, scrapes, scratches and muddy feet won’t mar the surface of the floor. The kitchen has stainless steel appliances, and even has a dishwasher for those who want to sanitize their dishes, pots and pans. A utility area has a full-size stackable washer and dryer, and the living room has sofa that disappears underneath a bed that folds down for the wall. In addition to showcasing The Texas Two-Step, Sternfeld will make a presentation discussing “Alternative Building Materials for Tiny Houses, Why it Matters, and Why You Should Care” starting at 2 p.m. on Saturday, Oct. 28, 2017. Taking place on the Village Stage, Sternfeld will point out the pros and cons of various traditional building techniques, and discuss some advanced construction products that have recently hit the market, in addition to talking about new uses for products such as concrete. For those who want to buy the Texas Two-Step or talk to the design team about creating a one-of- a-kind custom tiny home, you can learn more about Superior Concrete Tiny Houses or Superior Concrete Products, and the company’s other state-of- the-art line of tiny homes, buildings, precast fence and retaining wall merchandise, by calling 817-277- 9255 or visiting ConcreteFence.com and ConcreteTinyHouses.com. For more news on the 2017 National Tiny House and Simple Living Jamboree,go to TinyHouseJamboree.com. The beginning of Superior Concrete Tiny Houses – The Original Concrete Tiny House Co. traces back to 1986 when Superior Concrete Products was formed. Superior Concrete Products engineers, manufactures and installs precast concrete fences, structures and other retaining wall systems for the utility substations, residential developments, golf courses and the farming/ranching industries throughout North America. The company also has installations abroad and licenses precast mold products and services in countries around the globe. Starting in January 2016, Superior Concrete Products expanded into the Tiny House market when the owner Todd Sternfeld became a builder of small homes and tiny houses in Texas. A natural extension of its existing product lines, Superior Concrete Tiny Houses specializes in building small concrete tiny homes, and is certified by the National Precast Concrete Association through its affiliation with Superior Concrete Products. Both companies are headquartered in Euless, Texas. For more information, go to ConcreteTinyHouses or ConcreteFence.com. ©Copyright 2018, Superior Tiny Houses, Inc.